One of my usual searches at flea markets is for vintage linens in good condition. 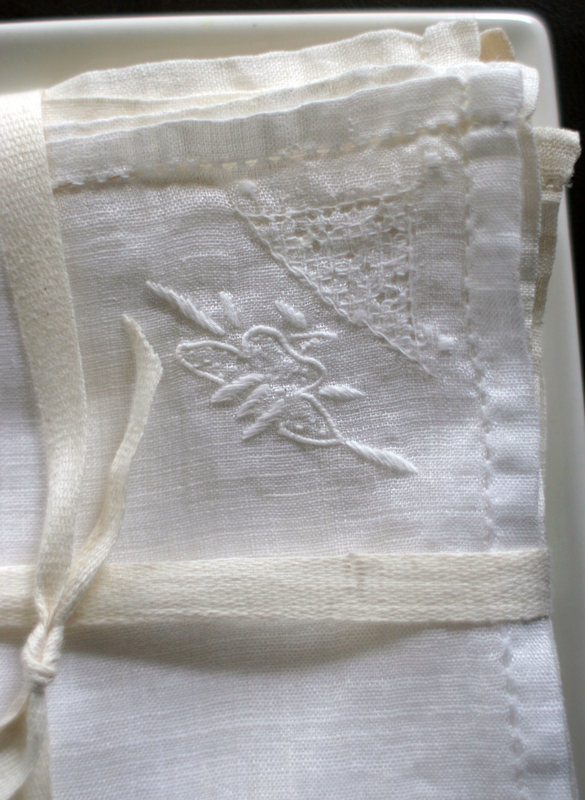 I get especially excited when I find unused vintage Irish linen napkins with the original label still attached. Linen lasts forever and washes beautifully in the machine. For tough stains I pre-treat with Dr. Bronner’s liquid soap. 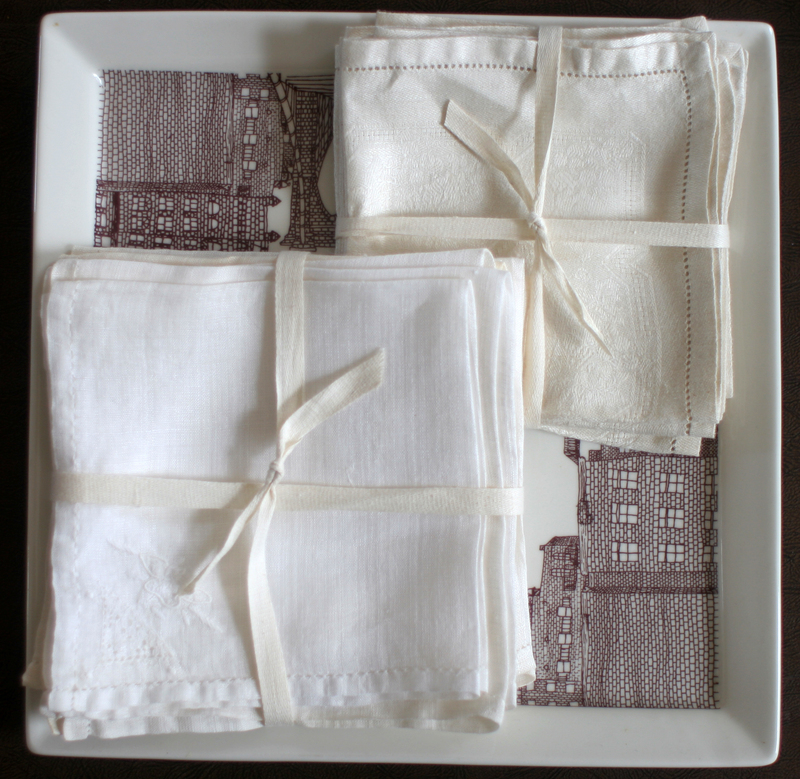 We use the cloth napkins at mealtimes and the dish towels for drying the dishes afterward. I find that if we have paper towels and napkins at our house that we use a ton of them. The linens save paper and make dinner seem a little fancier. 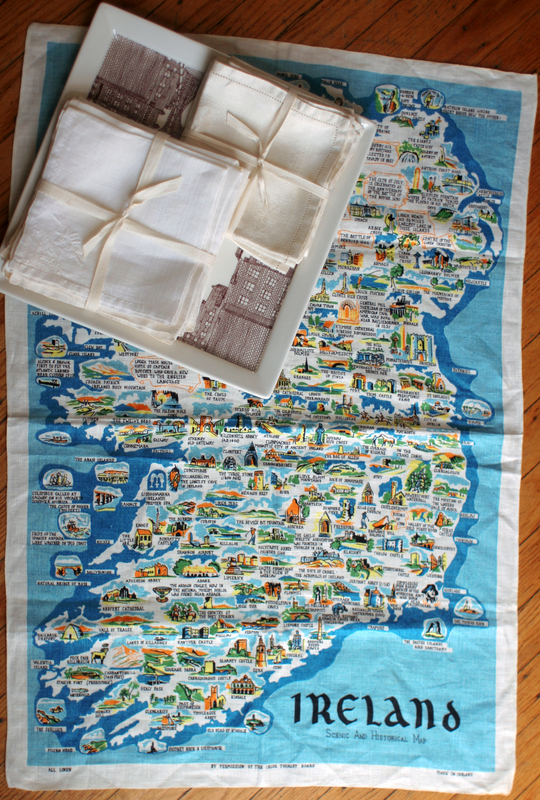 I found these napkins and Ireland dish towel at the Brooklyn Flea this weekend. The booth owner even washed, pressed and tied the napkins with twill tape. All 11 napkins and the towel came to $20. Bargain! Ebay has some pretty vintage napkins here and dish towels here. It really does save a ton of money. Since I sew – I recycle like crazy. Sections of my old aprons, get turned into everyday handkerchiefs, salvageable squares of worn flannel pillowcases are dust-cloths, and I make all of our napkins out of bargain fabrics found in the Red Tag section at Joann’s. Sheets that are frayed in only a certain area, get cut down into new pillow cases. I also buy bar mop and lint free toweling for all cleaning, in lieu of paper towels. They can be washed over and over, and last for years. Between these methods, and home made cleaners and laundry detergent – it saves hundreds every year. Besides – cloth napkins and hankies are so-o-o much nicer to use – especially on my sensitive nose! 🙂 Your flea market finds are exquisite.